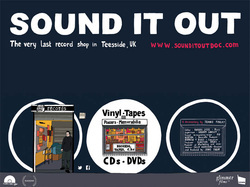 A cultural haven in one of the most deprived areas in the UK, SOUND IT OUT documents a place that is thriving against the odds and the local community that keeps it alive. Directed by Jeanie Finlay who grew up three miles from the shop. A distinctive, funny and intimate film about men, the North and the irreplaceable role music plays in our lives. High Fidelity with a Northern Accent.